Amtrak leased two Canadian-built LRC trainsets with special Amtrak paint schemes. Since the 1960s, nations including Japan and France had been developing high-speed rail technologies, but many of their advanced designs were intended for use on new, separate right-of-ways. In an informational booklet, Bombardier noted that the LRCs were “designed and developed over a twelve year period” and were meant to travel at speeds up to 125 mph on existing rail infrastructure.2 Without building new right-of-ways, companies could take advantage of LRC features such as tilt technology, in which the cars handled curves at higher speeds than conventional equipment by leaning into them by up to 8.5 degrees. 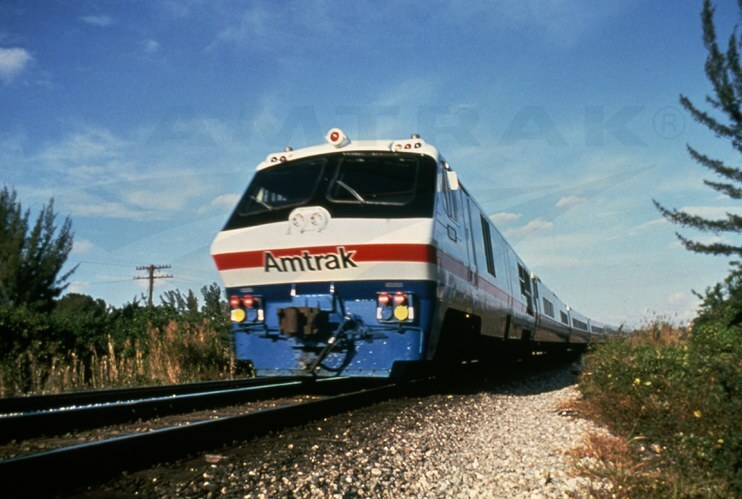 The streamlined LRC locomotive was compact compared to the Amtrak F40PH locomotives then in use. 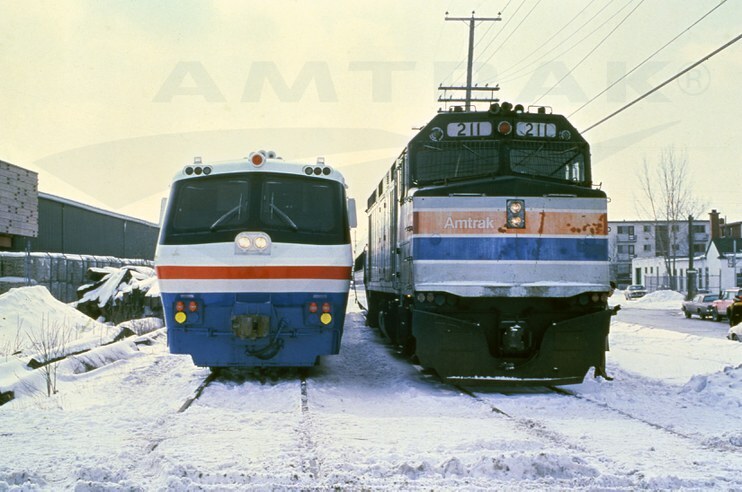 Amtrak signed a two-year lease for a pair of trainsets in early 1977, with the intention of testing them on the Vancouver, B.C. – Seattle – Portland corridor (today served by the Amtrak Cascades). The train’s low, streamlined profile and tilt technology made it well suited to the curving route along Puget Sound. According to an article in the February 15, 1977 issue of Amtrak NEWS, the company hoped to shave at least 50 minutes off the approximately 9 hour scheduled run. The LRC cars could tilt 8.5 degrees into a curve. 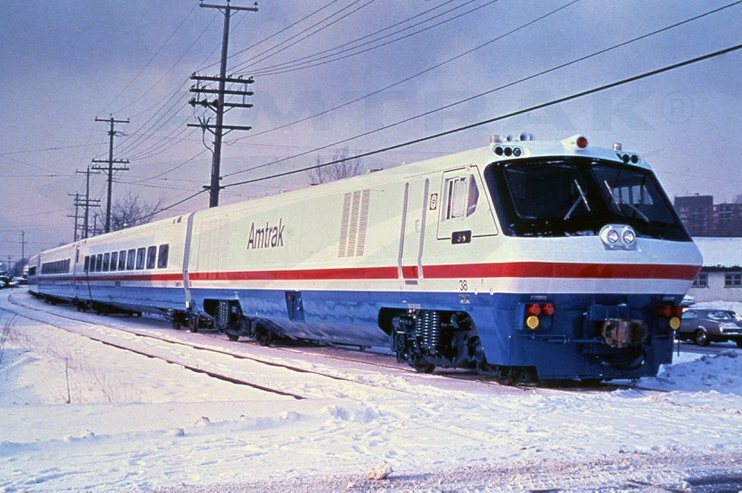 Although supposed to enter service by early 1979, the trains’ delivery was delayed by a strike at the Bombardier manufacturing plant.7 Amtrak subsequently received the first trainset in July 1980, put it through three months of testing, and entered it into revenue service at the end of September.8 In the intervening years, Amtrak had decided to switch the test ground to the East Coast, with the trainsets primarily operating on the NEC’s then non-electrified territory between New Haven, Conn., and Boston. The cars were also used south of New Haven when pulled by an electric locomotive such as the new AEM-7. Each trainset included one locomotive, four coaches and a club/food service car. Following expiration of the lease, the LRCs were returned to the manufacturer. VIA Rail Canada subsequently purchased LRCs and continues to operate LRC cars on its Windsor-Quebec City corridor, although all of the distinctive LRC locomotives have been retired. 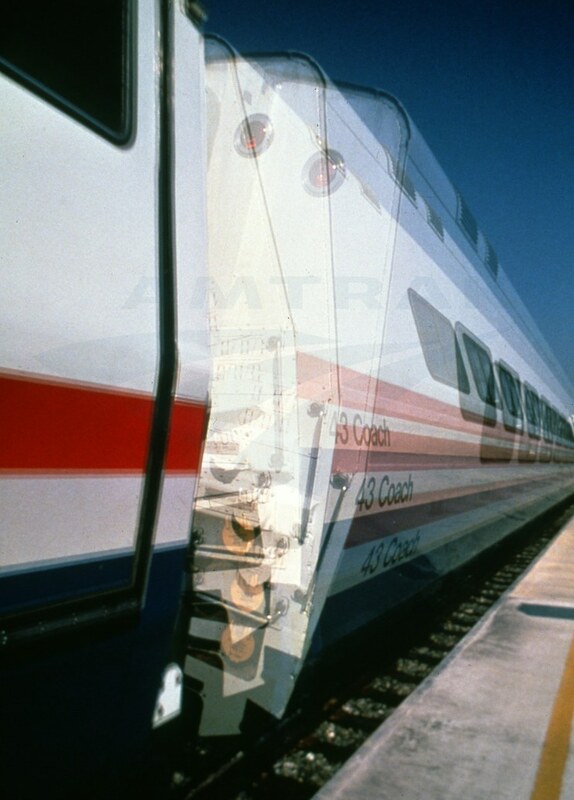 A consortium of Bombardier and Alstom would later design and manufacture the high-speed Acela Express trainsets, which entered revenue service on the NEC in December 2000. Each of the 20 train sets includes five passenger cars and one food service car between power cars at each end. To prepare for the arrival of high-speed rail service, the northern end of the NEC was electrified, which included the installation of catenary poles, wires and electrical substations. 1 "Agreement Signed to Lease Two Canadian-Built LRC Trains," Amtrak NEWS, February 15, 1977. 1. 2 Bombardier Inc. “The LRC Train: Speeding Passenger Rail Into the Future. Now.,” April 1981. 5 Nelligan, Tom. “Bienvenue LRC,” Trains Magazine, January 1981. 6 “LRC Locomotive, Car Tested On Amtrak Routes,” Amtrak NEWS, May 1, 1977. 2. 7 Nelligan, Tom. “Bienvenue LRC,” Trains Magazine, January 1981.